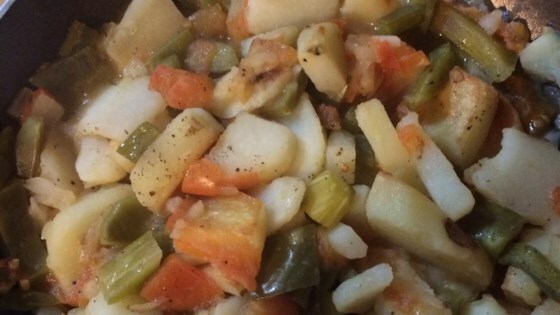 "An authentic Mexican dish; tender cactus with potatoes. Cactus tastes like cooked green beans." Heat the vegetable oil in a large skillet over medium heat. Add the potatoes, cover, and cook, stirring occasionally until they begin to soften, about 10 minutes. Stir in the nopalitos, onion, tomato, and jalapeno. Season to taste with salt, and continue cooking and stirring until the onion has softened and turned translucent, and the potatoes are tender, about 10 minutes more. See how to make simple pasta with sardines and fennel. This was great, only I used fresh cactus as I don't like the canned ones. I found this recipe quite simple to make yet very tasting. Though to add a bit of spice, I added a habanero pepper as well. Great recipe! I used fresh nopalitos and prepared them by boiling in water for 5-6 minutes, draining them, and boiling again for 5-6 minutes. We love Mexican food and this is a fabulous recipe. Very easy to make. I didn't have fresh tomatoes but used canned diced tomatoes which worked just fine. Thanks! Excellent flavor, easy prep. Only question: is the Nopales supposed to get a bit gooey? I love it even still. We loved it! I added 1 lb. extra lean ground beef and it was yummy. The beef actually made the nopalitos not gooey. It was delicious! The ratio of potatoes to everything else is too high. Use fewer potatoes, more of everything else. Don't let your husband go crazy with dried jalapeño flakes.